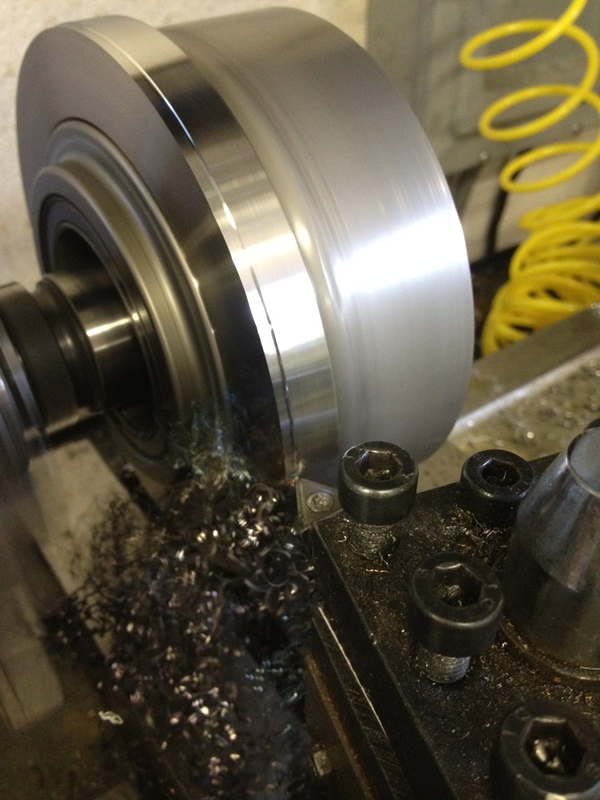 Merged a few threads today to consolidate the flywheel stuff. Figured Id start a thread here in the knowledge forum to talk about and track flywheels lightened, and what users had to say. I started working on another one today. But this thread is for ALL users, or interested forum members. It's not a sales ad.... If you had a local shop, Rodger Ditchfield or whittled your own flywheel down.. Please post up.. 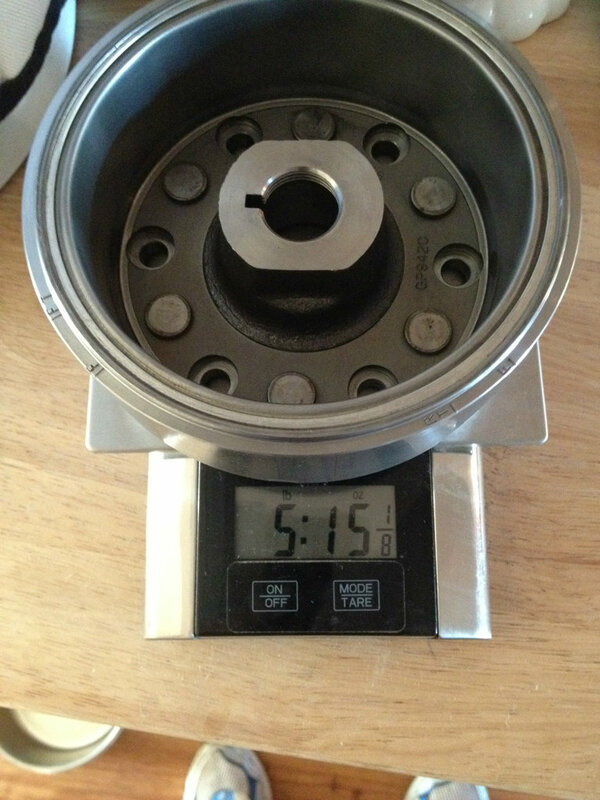 Things like starting weight, did it have balancing holes drilled in the weight? 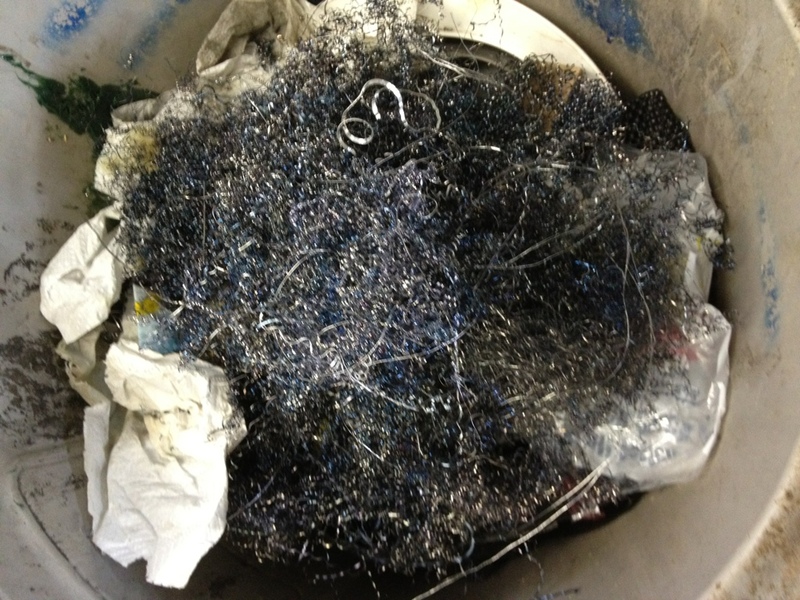 how much and from where was the materiel removed? Did you have a target weight in mind? 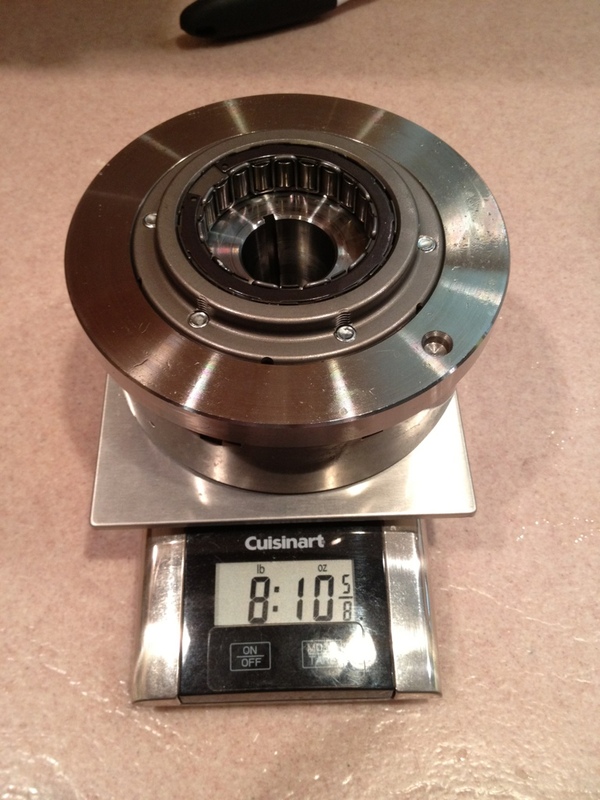 or just a dimensions to be cut to, and end weight is just a byproduct? Did you have it balanced afterwords? If so where and how much did that cost? Post install usability.. what did you notice after installation? This is #30 im working best i can tell... I have quotes and emails on three servers, across three different internet forums and hundreds of back and forth emails. Nothing but good things to say about the results. I'll try and consolidate a bunch of scattered posts to this thread when i get some time.ck it up in the lathe... see what we can cut off it. Last edited by E.Marquez; 04-03-2018 at 07:51 AM. 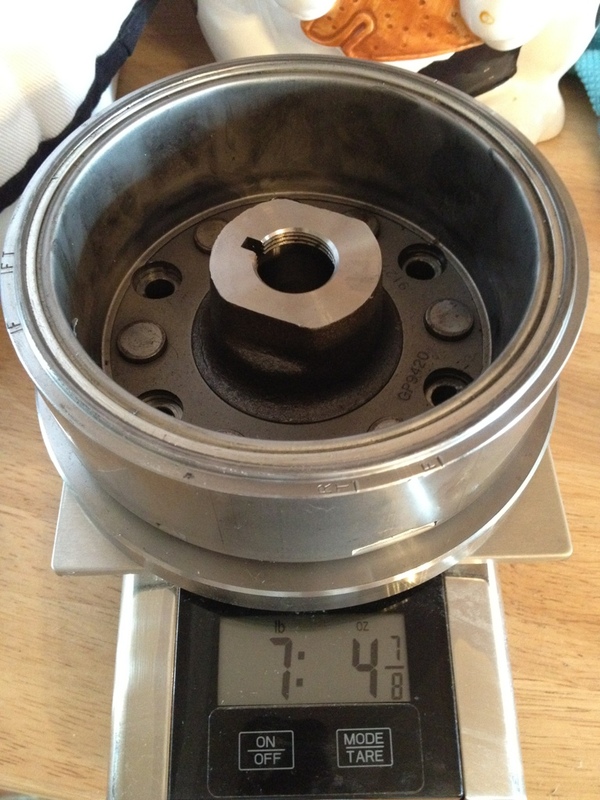 It started at about 160mm.. the Rodger Ditchfield spec is 146mm. 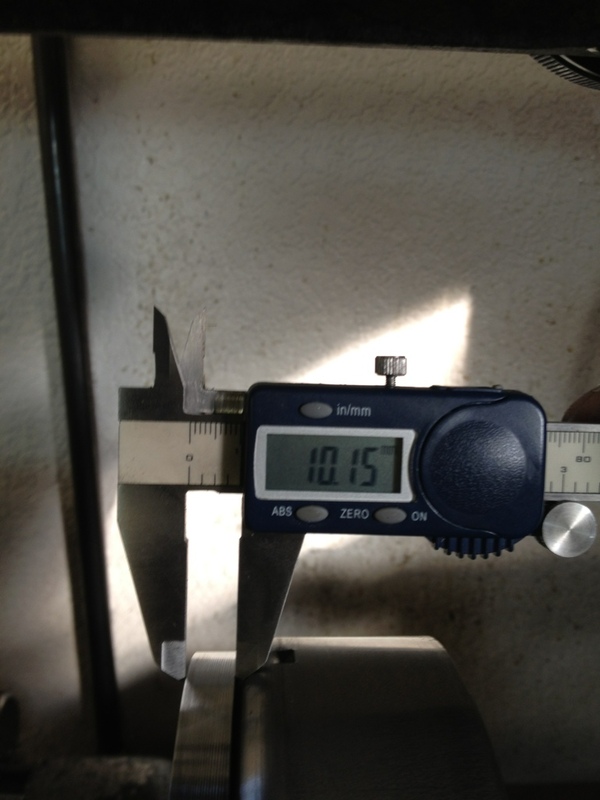 Im at 145.56mm now. Last edited by E.Marquez; 07-22-2012 at 09:10 AM. awesome, so heres the real controversial question - to balance or not to balance? 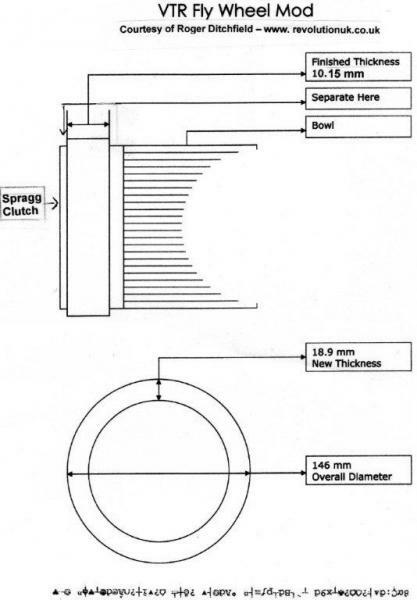 I have read atleast a dozen threads on flywheel lightening and it just turns into a jumbled mess of a debate between "roger saying it must be balanced" and "moriwaki saying take a half inch off and slap it on"
No idea as I do not have a dynamic balancer at my disposal.. So it's not controversial question at all to me.... I have removed some from the OD, and some from the width, and will run it as is. To me, common sense would dictate that if it was balanced prior to removing some material, it should have maintained it's balance afterwards since the metal is uniformly dense and one side doesn't weigh more than the other. I agree with the moriwaki theory to just slap it on... I dont quite agree with rogers theory that it has to be balanced because it was already balanced and the material being taken off is being removed equally all the way around.. that and the fact that any imbalance will be reduced by both reducing weight and reducing the diameter/circumfrence. While I do not have experience directly relating to the Superhawk's twin yet, in other powersports I've removed material from the circumference of flywheels without balancing and have not noticed any irratic vibrations or irregularities in crank bearing wear upon tear down. Some of these motors I spin upwards of 12,000rpm. I would run what you have, and keep a watchful eye on the behavior.... but I wouldn't stress about it. In all honesty.. I will say, if it was dynamically balanced before, it's not now...I removed mass from the assembly, and the size, placement, of the balancing adjustment (added or removed weight) in a dynamic balance is located in all three axis. Removing mass, changed that balance. It's installed.......... New bars are installed,,,, Im going for a ride.... See Ya. I'll see your RD flywheel specs and raise you one. Again, assuming the flywheel was dynamically balanced from the factory, after cutting material off.. it no longer is...Is anyone still debating THAT point? If it was only statically balanced in one axis, removing materiel uniformly from the OD,concentrically to the center static balance should be minimally effected. The RD cut down will effect the OEM balance due to the overall removal of materiel and that it cuts into the OEM balance adjustment points. Again as tweety pointed out,, it's more of a question.. HOW MUCH does it effect imbalance.. not really if. I think not enough to matter.... and my first test ride last night supports that theory. Last edited by E.Marquez; 07-22-2012 at 06:36 AM. Now, can you give us your feedback on the actual test ride? Did you feel a difference in acceleration and deceleration? Is this really noticeable as a single mod' for the average rider if you can judge that? Don't get me wrong, not criticizing at all, I'm actually all for it and it is on my list as well. Just want to gauge how much actual noticeable difference you get. Yes it makes a felt difference. Would I pay a local machine shop for an hour of labor to do this.. well maybe...but likely not if just for the change on an otherwise stock bike. But maybe so as it does make a difference you can feel....question is,,,is it a better difference? That only the individual rider can answer for them selves.. This is a good point to make... it is snappier, in both good and bad ways. It makes you have to focus on throttle control a bit more and can jerk you around a bit if you become lazy with the right wrist. Personally I really enjoy a lightened flywheel (on an otherwise almost stock motor), but could see if someone wouldn't. You will affect balance anyway, no matter you remove from OD or thickness. I suppose it is dynamically balanced. But I agree with you, I don´t matter balancing. The flywheel will have some imbalance. the imbalance rotates with the crankshaft. There is no "reversing" stress induced to the crankshaft. 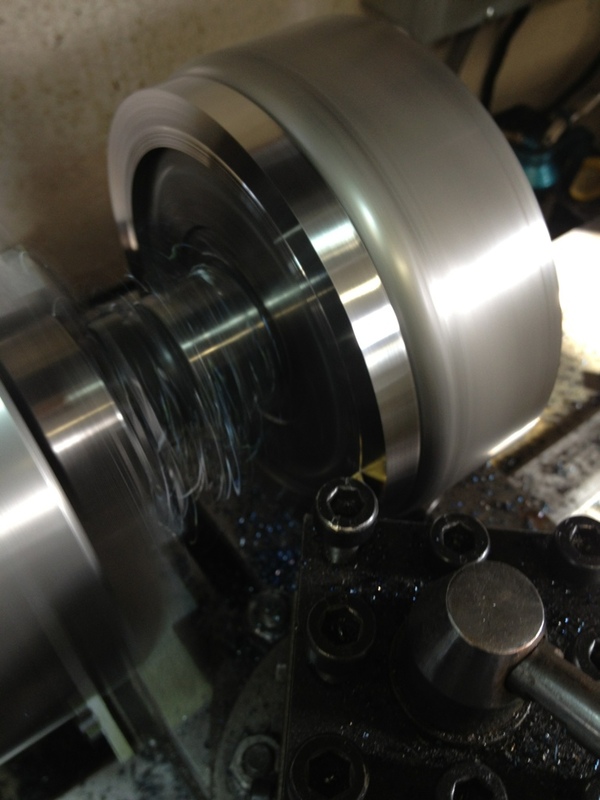 The end result will be a small amount of vibration at the rotating speed of the crank. It will most likely not be noticeable and will certainly not damage the engine. The imbalance force is orders of magnitude smaller than the forces applied to the crank by the connecting rods. How does this mod effect deceleration and engine braking. Can it be felt? Is there less engine braking? Just curious if it can really be felt there. I love the SH's engine braking. There is actually more engine braking because there is less flywheel momentum to counteract it. In other words, the throttle is more sensitive (less smooth) in both directions, not just accelerating. Spent an hour in the garage today, working on a second flywheel. Replicated the Roger Ditchfield version.. Started at 7 lb 4 7/8 oz that's with the sprag clutch removed. Cut it down in both diameter and width form the back side. I have a spare flywheel I'd be happy to have you shave for me!? Wow this is a great post as I'm looking for some exciting projects to do on my first SH this winter. Can anyone provide ball park pricing on what a local machine shop would charge for this service? Wont know till you call.... But you'll find a mix of wont touch it.. based on what they would have to charge to make it worth their time, to liability issues (they don't know the part, use, motor) TO a large fee of $100-200.-- as they really don't want the job. Then there is that one small piece meal shop, that will do it for a case of beer,,,, or $25, or a hand shake and promise of future business. There are none of those kinds of shops around me here in my part of Texas.... with some luck you will find one near you. I would think if there were balancing holes that you are machining through then you'd definitaly want to rebalance the flywheel. However that doesn't look to be the case so I don't think it'd be much issue needing to balance. A good way to turn one of the high charging shops into the handshake and a case of beer shop is get to know someone who works there. If you can find someone at a machine shop that rides. Or find a friend or someone you know who works at a machine shop they may be able to stay late and do it on their own time. Might even be able to get you in the shop to watch as they do it. A much debated topic.. Balancing after weight reduction. Do a search here you’ll find many posts.. In short,, there are balancing holes , I did machine through them, I did not rebalance it seems to make no difference to the bike.. But I understand your position and likely it is out of balance, to what degree and if it makes a real difference is the question. Honestly.. I looked at having it balanced.... but could find no show willing to take on the job.. There are a few in the US, but geared towed teams and other users that have way more money than I do for such a task. For what it was going to cost me to have it dynamically balanced.. I can buy a new motor off Ebay and start again. Last edited by E.Marquez; 08-27-2012 at 05:20 PM. 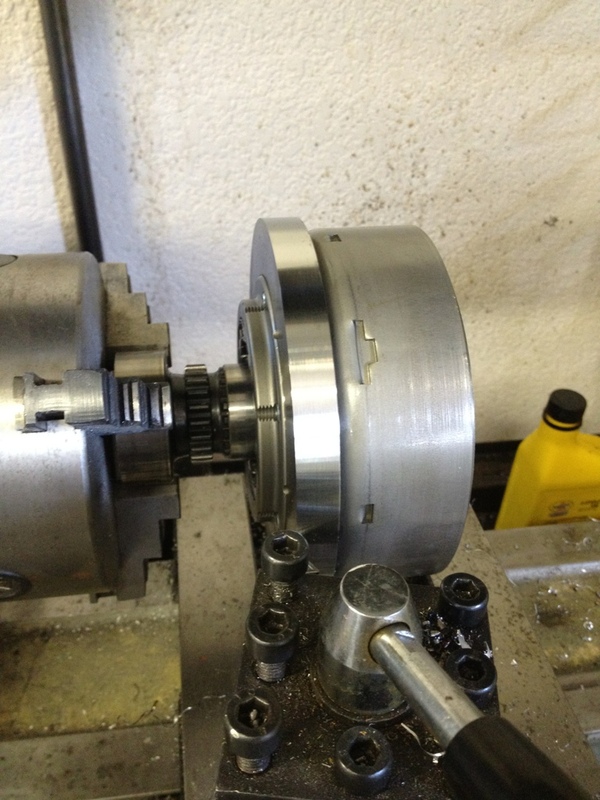 we have a shop by us that balanced our snowmobile flywheel we made. They do spin balancing up to 20krpm or something like that. Luckily, they are also a customer, so it was easy to swing.